Koavf, will this broom fit? OK. I've added you the bureaucrat & staff rights. The staff rigths add only the access to Special:SpamRegex on this wiki, nothing more. I have no possibility to switch the checkuser user rights on. I suppose only Sysadmin can do it. 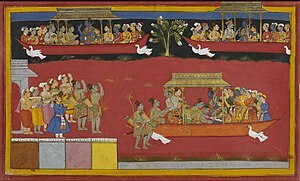 Rama being welcomed back to Ayodhya. also shown him flying in the Pushpak Vimana, the celestial flying machine. There is a moderation extension to allow open registration. Because it is a single point of spam protection, pages do not need to protected, users should not be blocked, IP ranges are not blocked (including TOR and proxies), and spamregex is no longer a thing. The staff user-right now does a whole bunch of stuff, all of which is included in either admin or crat except for being able to lock the database in emergency (Scram!!! on the sidebar). Both staff members also have access to the server backend in case of technical errors. The checkuser extension is disabled in the backend so doesn't work by design, it can be switched on in case of emergency. New users become autoconfirmed in 10 minutes and 1 edit, and cannot create pages until this happens. This is to stop a spambot flooding the moderation queue. There are various new extensions, special character support, etc. Everything is slightly updated. why did you remove this page from our collection of the works of laura ingalls wilder? ...perhaps you are not familiar with the author Laura Ingalls Wilder? we have a page & a category for her, she is an extremely notable US author. she wrote the "little House" series of children's books, among other things. she got her start writing material for newspapers & magazines, mostly related to farming. & our website has THE BEST collection of her pd works online. i spent a lot of time working on that. the material you erased was an EARLY EXAMPLE of her PUBLISHED work, which is not easy to find. & if i recall correctly, it was a column, not a letter. this material is of interest to those who study the works of this author. not to mention schoolchildren with assignments about her. please restore the material (page & image). & please DO NOT engage in such hap-hazard deletions in the future. especially when you are not familiar with the material, or the scholarship about the author. this site is a great deal less formal that the wikimedia projects. but there is is a matter of procedure & mutual respect, in deleting material. if we do not follow that, this community will disintegrate. & the notation (above the image) was copied from the source (which was CLEARLY indicated in the notation above the image), & was not "all caps". the capitalisation was, if i recall correctly, transcribed exactly as shown in the HEADLINE of the article. the image was of the ORIGINAL ARTICLE as published. & it was not an excessively-large file. This page was last edited on 5 March 2019, at 01:26.